This park opened again this past summer. There's free parking near the firebreak trail. If you go a little further down the road there's a place for boaters to pay, but you can just ask for a trail map and turn around and park where it's free. I went this morning as there is little to no shade. Saw a bunch of deer and a monarch butterfly. 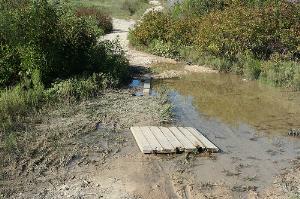 There's also a little creek sort of place that crosses Fire lane with just a board to get across the mud, but it's not bad. As a bonus as of right now the very shallow pool is teeming with tadpoles. I was alone pretty much the entire time I was out. I was passed by one biker and as I was heading to my car a lady was just coming in with her dog.